In the galaxy of lawyers in the seventeenth-century Dutch Republic Hugo Grotius is at the very center. Other lawyers are judged according to their contributions to legal doctrine. In this view Simon van Leeuwen (1626-1682) would figure near the outer rim, because he was more a compiler and commentator. Nevertheless, he shared with Grotius among other things an interest in Dutch history. In this post I would like to look at Van Leeuwen’s books, and in particular his posthumously published work on Dutch history. This year I could benefit time and again from its information while researching the lives of some people living in the Golden Age of the Dutch Republic. My curiosity to find out more about his works prompted me to write here in my series Opening a book. Van Leeuwen translated for example also a work in the field of world history. My search brought me back to the repertory of Dutch Early Modern historians, Repertorium van geschiedschrijvers in Nederland 1500-1800 by E.O.G. Haitsma Mulier and G. van der Lem (The Hague 1990), now also available online in the Digitale Bibliotheek voor de Nederlandse Letteren. If you check for Simon van Leeuwen in the Short Title Catalogue Netherlands you will get nearly ninety hits, and the earliest book shown is his edition in 1651 of a work by Quintyn Weytsen, Een tractaet van avarien, a work about general average, cases in maritime law about unavoidable damage to ships, a matter dealt with here three years ago. In 1652 van Leeuwen published his first own book, Paratitula juris novissimi dat is Een kort begrip van het Rooms-Hollandts-reght (Leiden 1652), with in the subtitle the term that made him famous, the Rooms-Hollands recht, the Roman-Dutch Law. I had expected the exhibit of the Robbins Collections of Berkely’s School of Law would at last resurface on its redesigned website, but as for now you can only view the starting page of The Roman-Dutch Legal Tradition. Notaries are the subject of his following book, Notarius publicus, dat is, De practycke ende oeffeninge der notarissen (first edition, Dordrecht 1657), but actually it had already been printed a year earlier as an additional part of the second edition of the Paratitula (Leiden 1656). In this book he offers also a dictionary of Dutch law terms, including the neologisms coined by Grotius in his Inleidinge tot de Hollandsche regtsgeleerdheid (1631). Van Leeuwen’s practice as a lawyer explains to some extent his choice of subjects. He was born in Leiden where he studied literature and law at the university. After receiving his law degree in 1646 he started as a barrister in The Hague at the Hof van Holland and the Supreme Council, and later in Leiden. In 1681 he returns to the Dutch Supreme Council, the Hoge Raad van Holland en Zeeland. In 1659 appeared his first work on Dutch history, Redeningh over den oorspronck, reght, ende onderscheyt der edelen, ende wel-borenen in Hollandt, literally translated “an argument about the origin, law and distinction of noblemen and gentry in Holland”, a subject which should indeed interest people in a country that aspired to be a real republic of equal citizens. In 1659 appeared also his translation of a book by Petrus Peckius (1529-1589), De iure sistendi, with the Dutch title Verhandelinghe van handt-opleggen ende besetten: dat is, Arrest op persoon ende goederen (Leiden 1659), a book about the way one could arrest people and legally seize goods. His following book is in Latin, which no doubt helped to get noticed by lawyers all over Europe, Censura forensis, theoretico-practica id est Totius juris civilis, Romani […] methodica collatio (Lugduni Batavorum 1662). A year later appeared an even more ambitious work, an enlarged version of the edition by Denis Godefroy and Antonius Anselmus of the Corpus Iuris Civilis (Amsterdam-Leiden 1663). A few years later Van Leeuwen chose a more restricted subject, court procedure, in his Manier van procederen in civile en criminele saaken (Leiden 1666). In 1667 appeared his translation of a work in Latin on Persian history by Johannes de Laet (1593-1649), Voyagien, naa, en door het groot en magtige koninkryk van Persia (Amsterdam 1667) [Persia seu Regni Persici status variaque itinera in atque per Persiam]. 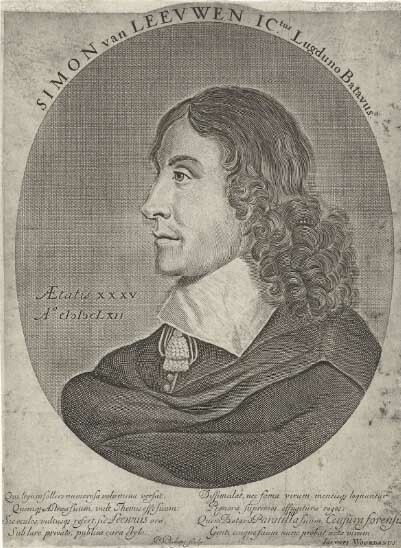 De Laet (latinized Laetius), a student at Leiden of Scaliger, was a pioneer of comparative linguistics and world geography, and also a governor of the Dutch West India Company. Van Leeuwen commands our respect for his wide interest and his personal combination of global and more local matters. In 1667 Van Leeuwen published also two editions of sources, the Handvesten ende privilegien van den lande van Rijnland, met den gevolge van dien, and Costumen, keuren, ende ordonnantien, van het baljuschap ende lande van Rijnland, in particular ordinances and privileges of Rijnland, the area around Leiden which in one particular respect, water government, formed a unity. We shall see below how he used these sources in the work published only after his death. in 1671 appeared a work on the history of Roman law he wrote together with Arnoldus Vinnius (1588-1657), De origine & progressu juris civilis Romani authores & fragmenta veterum juris consultorum, to which he contributed two chapters. The last independent work published during Van Leeuwen’s life was a book on the history of Leiden, Korte besgryving van het Lugdunum Batavorum nu Leyden (Leiden 1672). The collection of legal consultations Bellum juridicum: ofte Den oorlogh der advocaten (Amsterdam 1683) is ascribed to him, but there is reasonable doubt about his authorship. One of the reasons for this doubt is that we know Van Leeuwen helped in this very year Cornelis Cau in publishing the third volume of the massive collections of ordinances issued by the General Estates and the States of Holland, the Groot placaet-boeck, vervattende de placaten […] van de […] Staten Generael […] ende van de […] Staten van Hollandt ende West-Vrieslandt (third volume, The Hague 1683). With Van Leeuwen we encounter a writer interested in several subjects: Dutch law, Dutch history, Roman law and even world history. In my view he clearly aspired to have a part in major projects both within Holland and on an European scale. Only by considering this context you can arrive at an explanation for the title of his posthumously published massive work Batavia illustrata, ofte Verhandelinge vanden oorspronk, voortgank, zeden, eere, staat en godtsdienst van Oud Batavien (…) (1 vol. in 2 parts, The Hague 1685), “Illustrious Holland, or a treatise on the origin, progress, traditions, state and religion of Old Batavia“. Van Leeuwen presents here materials around an enlarged edition of a work by Wouter van Goudhoeven (1577-1628), D’oude chronijcke ende historien van Holland (first edition 1620), in itself a continuation of the so-called Divisiekroniek, first printed in the early sixteenth century. Van Leeuwen does not only follow the foot steps of Dutch historians, but chooses a title, Batavia Illustrata which in a way sounds as a conscious imitation of the title of a famous work on the history of Italy, Italia illustrata by Flavio Biondo. The frontispiece of Van Leeuwen’s opus ultimum shows in front of the two angels with the title at the left an allegory of the Dutch virgin with a staff bearing the hat of library and a hand caressing the Dutch lion, and at the same time telling Clio, the muse of history, the stories of Holland’s glory which she jots down in the book on her knees. If you read the complete title on the title page you cannot miss the double approach of this work, a continuation and improvement on earlier histories and a work based on research in oude schriften ende authenticque stukken, “old manuscripts and original records”. The gentry, too, appears in Van Leeuwen’s long title. An overview of genteel families in Holland is a major feature of his book, with lots of genealogical detail. It reads almost as a who is who of Dutch Early Modern history. Inevitably this work has been digitized by the Great Global Search Firm, but only in black-and-white. You had better use the version in the Digitale Sammlungen of the Bayerische Staatsbibliothek, Munich (vol. 1, vol. 2). The last part of the second volume contains several lists of all kind of Dutch officials, including the board members of three major hoogheemraadschappen, the independent boards responsible for water control and protection against the sea, Rijnland, Delfland (around Delft) and Schieland (near Rotterdam). Here you will find out why the museum Boymans-van Beuningen in Rotterdam is situated at a lane called Matenesserlaan, not only because of a field name, but also in recognition of the role of a powerful family. During my research on members of the Van Matenesse’s I found often more in Van Leeuwen’s book than in modern Dutch biographical works conveniently accessible online at the Biografisch Portaal. Of course I could also spot at some turns information which clearly is not correct, but in general this work is reliable. For me the point in writing here about Van Leeuwen is the fact he was not just a second-rank writer about Dutch law, however right this judgment surely is. Van Leeuwen did efforts to republish or translate the work of others, and he succeeded in collaborating on important publications of other Dutch authors. He did not only publish source editions, but used them also for his own historical works. Through his manuals on Dutch law, legal procedure and notarial law his influence on Dutch practitioners of the law was substantial. Both the original and the English translation of his work on the Roman-Dutch law influenced law in South Africa. On May 19, 2017 the fifth and final volume of the series “Bibliografie van de Nederlandse Rechtswetenschap tot 1811”, Bibliography of jurists of the Northern Netherlands active outside the Dutch universities to the year 1811, edited by the late Robert Feenstra and Douglas Osler (Amsterdam 2017), will be officially presented at the Peace Palace in The Hague. No doubt Van Leeuwen, too, figures in this volume, and the multitude of the reprints and re-editions of his works will come much more into view. This entry was posted in Scholars and tagged Early Modern history, Legal history, Netherlands, Political history, Rare books, Roman law, Water control on May 9, 2017 by rechtsgeschiedenis.